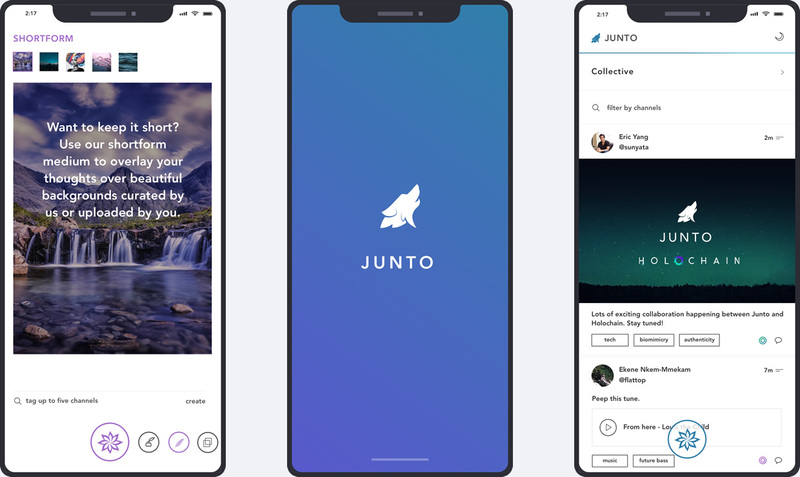 Junto integrates a more consciously designed interface, distributed technology, and a non-profit approach to create a space where people can truly be themselves. How do we make this vision a reality? Within Junto, there are no vanity metrics that intensify external validation of self worth. We empower people to curate their own experiences, rather than provide artificially intelligent feeds that reinforce existing perspectives. There are also no advertisements that dilute or commercialize self-expression. Authenticity is the foundation of a more harmonious culture. Unapologetic self-expression empowers people to live with enthusiasm and in freedom. It cultivates self-acceptance, which enables us to act with an open mind and a deeper sense of empathy. We live in an age where digital forms of communication have become a ubiquitous part of our lives. Social media has reshaped the way we think, express ourselves, and distribute and receive ideas. We want to move beyond these restrictive norms and facilitate a more open era of human connection. This is why we created Junto, a movement founded in the spirit of authenticity. Our platform is built on Holochain, a biomimicry-inspired framework for building scalable, distributed applications. As a result, users on Junto own their data, since we don’t track or sell any information. This makes Junto more private, secure, and censorship-resistant. Finally, Junto is a non-profit; this initiative is independent of investors and third parties. People from all walks of life are welcome to contribute wherever they can. Our technology is open source, we’ve launched a grassroots external team called Junto Pack, and we encourage people to continue self-organizing and coordinating in a distributed way. This project has been in the making since 2016. We released an alpha at Vanderbilt University, and subsequently iterated on tangible feedback. We’ve raised funding from several donors, including the co-founder of Holochain, Arthur Brock, and have grown to a team of five designers, developers, artists, and storytellers. Most of us have left school and/or our jobs to fully commit to bringing this to life. Through Junto, we have a real opportunity to accelerate the shift towards a decentralized internet while creating a space that enables expression in its purest form. As the next step in moving this project forward, we’re launching a Kickstarter campaign. Our Kickstarter will run for 30 days starting January 27th, and is intended to raise funds to grow this core community, ultimately preparing for our official release this summer. We are calling on those who want to help realize this vision to share our project and donate to our fundraising campaign. It’s going to take an active effort from many hands to shift this new paradigm.